Dr. C. L. Max Nikias first arrived at USC in 1991, and has served as a professor, national research center director, engineering dean, provost, and president. He serves the university as a life trustee and as its president emeritus. During his tenure as president, Nikias advanced USC’s premier academic and global standing, led a generational upgrade and expansion of both of the university’s campuses, and created college pathways for low-income students. In recognition of these advances, The Wall Street Journal and Times Higher Education now rank USC fifteenth among 1,061 American universities. 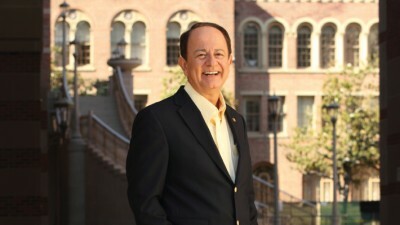 Under Nikias’ leadership, USC became one of the most selective universities in the nation. But even while relentlessly striving to improve student quality, Nikias reshaped the university into the most economically diverse of America’s elite private research institutions, with more first generation and low-income students than almost any other private university in the nation. USC remains the only private academically elite university to widely recruit community college transfers. Under Nikias, the university expanded its recruitment in this area and now accepts over 1,000 highly qualified community college transfers annually. To help attract qualified students from across the socio-economic strata, Nikias significantly boosted financial aid. In 2018, USC offered the largest overall student aid package in the country—$549 million annually in merit and need-based aid from its own sources—up from $180 million eight years earlier. In parallel, Nikias aggressively recruited national academy members and Nobel laureates, creating well over 100 faculty chairs between 2010 and 2018. With his background in engineering, Nikias positioned USC as a national leader in areas as diverse as biosciences, digital technology, and media. He also oversaw remarkable growth at USC’s academic medical center, where both clinical revenue and patient volume rose exponentially. Enabling the university’s growth trajectory has been the university’s ambitious fundraising campaign, Fas Regna Trojae—The Destined Reign of Troy, which was initially announced with a goal of $6 billion; at the time, this was the largest campaign in the history of higher education. Under Nikias’ leadership, USC achieved this goal 18 months ahead of schedule and raised $7 billion during his eight-year tenure. For six consecutive years during this same time, among our nation’s universities, only USC, Harvard, and Stanford have consistently ranked in the top five for cash fundraising. In the area of infrastructure, Nikias oversaw remarkable expansion while serving as president. The construction of athletics facilities and academic and residence halls has expanded USC’s square footage by about 30 percent. Beautification projects on both campuses improved sidewalks and landscaping, adding hundreds of trees and amenities, as well as art installations, including the Hecuba statue. Nikias also spearheaded USC’s lease agreement for the Los Angeles Memorial Coliseum and kicked off the university’s $270 million restoration of the iconic stadium. The most notable infrastructure project in the university’s recent history is the USC Village, a $750 million, 15-acre expansion of the University Park Campus. The project, which Nikias oversaw personally, increased the campus’ footprint by a third, changed the fabric of the neighborhood, and reshaped student life by transforming USC into a fully residential campus. At the same time, the university transitioned from ‘residential halls’ to ‘residential colleges,’ which offer unique programs for undergraduate students, led by in-residence faculty. Nikias also led an effort to reform student transportation, introducing a free ride-hailing service, which together with USC’s shuttle “Campus Cruiser” program, provides nearly 30,000 rides to students every week. Off campus, Nikias committed significant USC resources toward improving K-12 education, particularly in the underserved areas surrounding USC’s two campuses. Under his stewardship, the Neighborhood Academic Initiative’s reach nearly doubled, and by 2020, the program will enroll more than 1,100 sixth-through-12th-graders, with the goal of sending more than 100 students to four-year universities each year. The high school graduation rate of students enrolled in the program is 100 percent, and 99 percent of program graduates attend college. Underscoring USC’s status as a good neighbor is the growth of its economic impact, which nearly doubled under Nikias to more than $8 billion annually. By 2018, the university employed 27,400 staff and faculty, and supported a total of over 53,000 jobs across California. Globally, USC’s profile has expanded considerably under Nikias. International enrollment grew by 30 percent since 2010, and the university consistently ranks either first or second in the total number of international students, with students representing nearly 130 different nations, and more than 90 different religious viewpoints. In addition to previously opened offices in Hong Kong and Taipei, USC added offices in Beijing, London, Mexico City, Mumbai, São Paulo, Seoul, and Shanghai under Nikias’ leadership. During his time as provost, Nikias established the Visions and Voices program, and was instrumental in bringing USC trustee Steven Spielberg’s Shoah Foundation Institute and its vast video archive of Holocaust survivor testimonies to USC. As the Shoah Foundation expanded its archive, it also built a network of multi-university partnerships around the globe.